TCM is airing a centenary tribute to actor Joan Fontaine on Wednesday. The lineup includes her Academy Award-winning performance in director Alfred Hitchcock's thriller Suspicion (photo above). 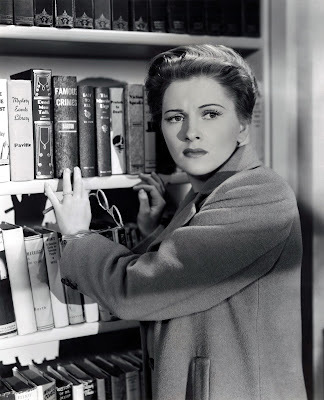 TCM is airing an 100th birthday tribute to actor Joan Fontaine that includes her roles in Suspicion (1941), Ivanhoe (1952), and The Constant Nymph (1943). There's also two nights of horror films and a lineup of movies about the Russian Revolution. 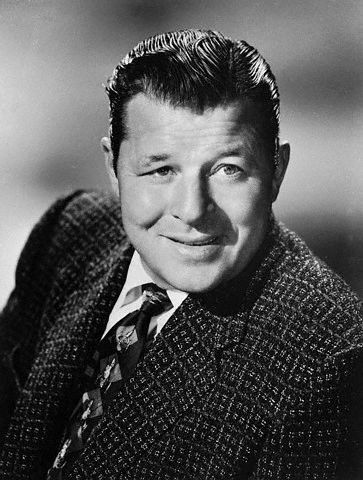 Birthday tributes: Joan Fontaine on Wednesday; Jack Carson on Friday. Noir Alley: Childhood friends Barbara Stanwyck and Kirk Douglas share a guilty secret in The Strange Love of Martha Ivers (1946) at 10 a.m. Sunday. This movie marks Douglas' screen debut. TCM Essentials: Howard Da Silva plays a sympathetic bartender in the alcoholism drama The Lost Weekend (1945) at 8 p.m. Saturday. Silent Sunday Nights: Haxan: Witchcraft Through the Ages (1922) at midnight is a Swedish documentary about superstition and the occult in the Middle Ages that includes now famous recreations of witches flying through the air, the Inquisition, and the devil himself. TCM Imports: Two Japanese films starting with historical horror outing Onibaba (1964) at 2:15 a.m. Sunday night/Monday morning. Ghost story Ugetsu (1953) is airing at 4:15 a.m.
Best Day to DVR: Wednesday daytime: TCM is airing an 100th birthday tribute to actor Joan Fontaine, who was born Joan de Havilland on Oct. 22, 1917, in Tokyo. The lineup: A Damsel in Distress (1937) at 6 a.m.; The Constant Nymph (1943) at 8 a.m.; The Devil's Own (1966) at 10 a.m.; Until They Sail (1957) at 11:45 a.m.; The Women (1939) at 1:30 p.m.; Ivanhoe at 4 p.m., and Suspicion at 6 p.m.
Bio: Fontaine and her older sister Olivia de Havilland were born in Tokyo to a British patent attorney and his wife. The family moved to California where both sisters pursued acting careers. Fontaine earned a contract at RKO Pictures where she subbed for Ginger Rogers in the Fred Astaire musical A Damsel in Distress. That movie was a flop, but Fontaine soon worked her way up in Hollywood with plum supporting roles in films like the all-star comedy The Women, and she won a best actress Oscar for playing Cary Grant's naive young wife in Suspicion. She was a top star in the 1940s and 1950s in films like the romance The Constant Nymph, the costume drama Ivanhoe, and the courtroom melodrama Until They Sail. In her later career, Fontaine turned to science-fiction and horror films, like the Hammer horror outing The Devil's Own (aka The Witches). 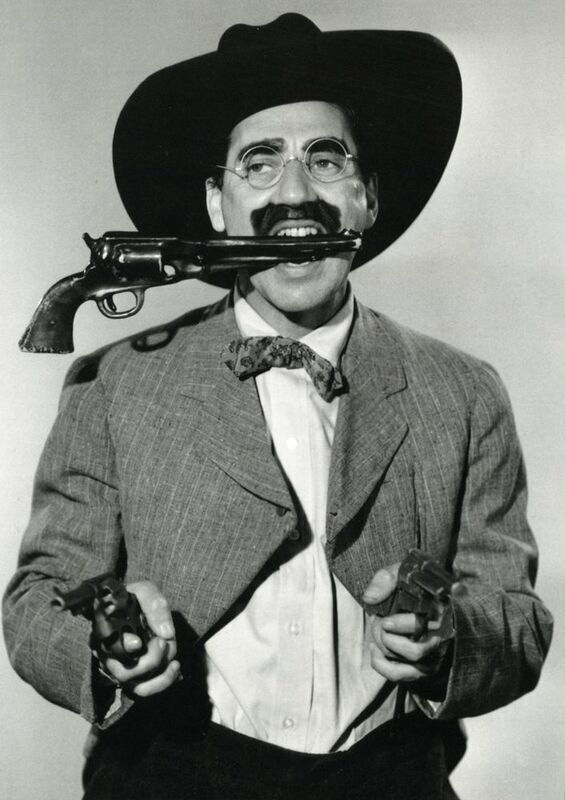 Groucho Marx in Go West (1940). Three daytime picks: The theme is movies from MGM producer Jack Cummings. A nephew of studio chief Louis B. Mayer, Cummings ran MGM's B movie unit, which produced films like the early Judy Garland musical Listen, Darling (1938) at 7:15 a.m. (Garland sings "Zing! Went the Strings of My Heart" in this movie) and the Marx Brothers vehicle Go West (1940) at 11:45 a.m. Cummings eventually had his own musical production unit where he made films like the Debbie Reynolds backstager Give a Girl a Break (1953) at 6:30 p.m.
Prime time lineup: Each Monday in October, TCM is partnering with the non-profit organization Women in Film to put the spotlight on the trailblazing ladies who worked behind the scenes in old Hollywood. Tonight's lineup features female editors in the modern era. Editor Anne V. Coates has worked on several prestigious projects including Lawrence of Arabia (not airing) and The Elephant Man (1980) at 8 p.m. Editor Susan Morse is known for her collaborations with director Woody Allen, including in the Oscar-winning film Hannah and Her Sisters (1986) at 10:15 p.m.
Late night pick: Editor Thelma Schoonmaker has worked with director Martin Scorsese since 1980 on films like the gangster saga Casino (1995) at 12:15 a.m.
Deborah Kerr in The Innocents (1961). Three daytime picks: The theme is Westerns set in Arizona starting with The Wizard of Oz star Frank Morgan as an Eastern tenderfoot who inherits a ranch in Henry Goes Arizona (1939) at 7:15 a.m. Next, Vincent Price takes a break from horror to ham it up as a swindler who tries to claim he owns the entire territory in The Baron of Arizona (1950) at 12:15 p.m. Alan Ladd and Ernest Borgnine plan a gold robbery in The Asphalt Jungle remake The Badlanders (1958) at 3:15 p.m.
Prime time lineup: Each Tuesday night in October, TCM is airing a lineup of classic horror films. 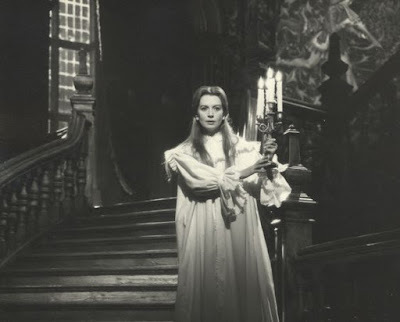 Tonight's movies are from the 1960s starting with Deborah Kerr as a proper English governess who sees dead people in The Innocents (1961) at 8 p.m. Horror icon Vincent Price is possessed by a malevolent spirit in Diary of Madman (1963) at 10 p.m.
Late night pick: The low-budget cult classic Carnival of Souls (1962) is on at 2 a.m.
Omar Sharif and Geraldine Chaplin filming a scene from Doctor Zhivago (1965). Three Daytime Picks: See the Best Day to DVR section. 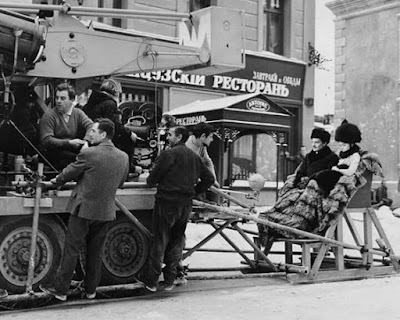 Prime time lineup: TCM is commemorating the 100th anniversary of the 1917 Russian Revolution with a lineup of films about one of the most momentous events of the 20th century. Probably the best known film about the Revolution is director David Lean's epic Doctor Zhivago (1965), which is airing at 8 p.m.
Late night pick: Nicholas and Alexandra (1971) at 8 p.m. is a biopic about the doomed Tsar (Michael Jayston) and his wife (Janet Suzman), while Rasputin and the Empress (1932) at 3 a.m. deals with Alexandra's unusual relationship with the faith healer and mystic Grigory Rapsutin. This movie is notable for being the only film that stars all three Barrymore siblings: Ethel Barrymore plays Alexandra, Lionel Barrymore play Rasputin, and John Barrymore plays a reform-minded Russian aristocrat. Rasputin, the Mad Monk (1966) at 5:30 a.m. is a Hammer horror film with Christopher Lee in the lead. A vintage Russian poster for The Battleship Potemkin (1925). 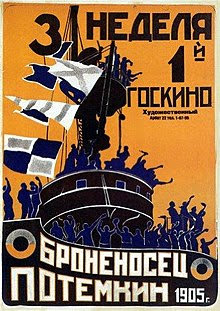 Three daytime picks: The movies about the Russian Revolution continue with two films from the great director Sergei Eisenstein about events leading up to the Revolution: The Strike (1925) at 7:30 a.m. is about a 1912 labor revolt and The Battleship Potemkin (1925) at 9 a.m. is about a 1905 naval mutiny. The afternoon lineup is devoted to old Hollywood offerings about the revolution including the Douglas Fairbanks, Jr.-Nancy Carroll romance Scarlet Dawn (1932) at noon (he's an aristocrat; she's a peasant) and the musical Balalaika (1939) at 5:30 p.m. (if you ever wondered how Nelson Eddy would fare against the Bolsheviks, this one is for you). Prime time lineup: The prime-time lineup is devoted to seventies science fiction starting with Charlton Heston as the leader of a group of biological warfare survivors in The Omega Man (1971) at 8 p.m. Michael York, Jenny Agutter, and Richard Jordan try to survive into middle age (they live in a dystopian future where everyone over 30 is killed) in Logan's Run (1975) at 10 p.m.
Late night pick: Heston and Edward G. Robinson find out exactly what is in their synthetic food in Soylent Green (1973) at 4:30 a.m.
Three daytime picks: A birthday tribute to Jack Carson, who was born Oct. 27, 1910, in Carman Manitoba. The amiable actor was often paired with great success with other forties Warner Bros. contract players: The comedy Make Your Own Bed (1944) at 10 a.m. stars Carson and Jane Wyman as engaged detectives who go undercover as servants. Carson and Dennis Morgan were a popular buddy act in Two Guys from Milwaukee (1946) at 1:30 p.m. and the musical It's a Great Feeling (1949) at 6:30 p.m., which also features Carson's frequent leading lady, Doris Day. Prime time lineup: Every Friday in October TCM will air films from star of the month Anthony Perkins. Tonight's lineup starts with Perkins' iconic role as mama's boy Norman Bates in Pyscho (1960) at 8 p.m. followed by he and Tuesday Weld as killers on the lam in Pretty Poison (1968) at 10:15 p.m.
Late night pick: The late night lineup features two fine performances from Perkins. The baseball biopic Fear Strikes Out (1957) at 2 a.m. is about Boston Red Sox player Jimmy Piersall's battle with mental illness. Perkins is also superb in the lead role in director Orson Welles' Franz Kafka adaptation The Trial (1963) at 4 a.m. The Essentials series continues at 8 p.m. with host Alec Baldwin. He will be joined by former late night host David Letterman to discuss the alcoholism drama The Lost Weekend (1945) at 8 p.m. followed by two more films featuring Howard Da Silva: The noir They Live by Night (1949) at 10 p.m. and the Hollywood remake of M (1951) at midnight. TCM will air Dracula movies every Sunday night in October. Tonight's lineup features two Hammer horror films with Christopher Lee. The immortal Count sets out to revenge his murdered servant in Taste the Blood of Dracula (1970) at 8 p.m. while the vampire experiences seventies London in Dracula A.D. 1972 at 10 p.m.